It’s summer and everyone is outdoors having fun. After cleaning up the ‘carnage’ left behind from a winter’s ice storm this spring, I took a look around at the rest of our outdoor decor to see what needed some extra lovin’. I bought this set at auction over the winter. The finish was in rough shape but it was solid, comfy and I picked it up for a song. For color inspiration I did some umbrella shopping and found an adorable red and white stripe one at Target. From there I selected a bright turquoise color to compliment the umbrella. 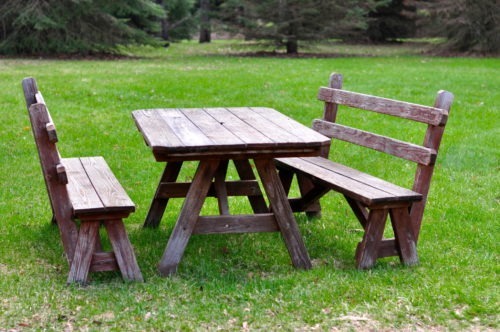 The set came with two benches. I started painting those first. 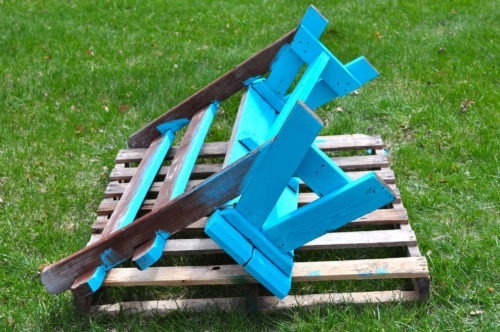 A quick tip for painting benches and chairs is to start with the bench upside down. 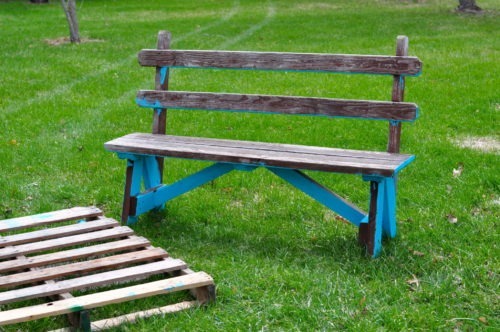 Paint everything you can see from this angle, then flip the bench over to paint the rest. The set was very dry and porous so I selected an inexpensive chip brush to paint with instead of using my good paint brushes. Rough/dry wood is hard on a brush. The thinner brush also helped make sure I didn’t overload my brush with too much paint and waste product. When you are painting outside, paint tends to dry rather quickly. This will cause you to over apply and use too much. To control this, I make sure to keep a spray bottle of water nearby and periodically spritz the piece as I paint. This allows me to extend my paint to make it stretch further. To give you an idea, I used one quart of paint on this entire project but if I hadn’t thinned the paint with water and used my spritzing technique it would have required quite a bit more. 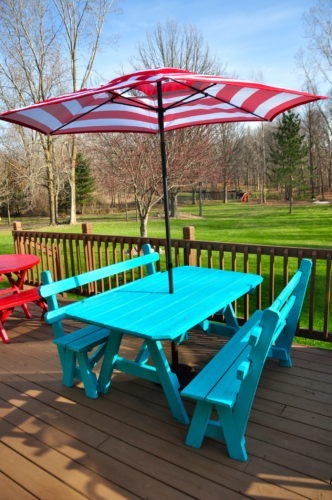 Another outside painting tip is to make sure you are not painting in direct sunlight. Paint in the shade, then set it out in the sun to dry. 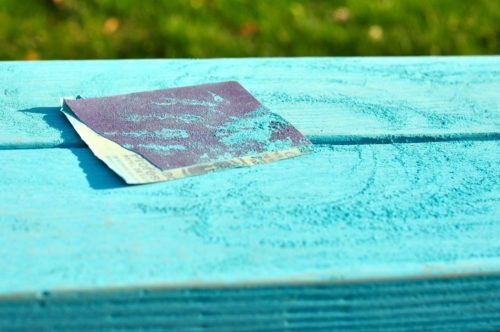 Once the set was dry, which happened super fast outside, I took a piece of fine sandpaper and distressed the entire set. Sanding it also helped ‘set’ the paint by burnishing it. At this point, I could simply buff it and set it back in the sun to cure then begin using it without applying any sealing product. I’ve found that the sun will cure the clay in the paint similar to baking it in a kiln. As it sits outside, it will weather naturally but will not wash off completely. For this set, however, because we would be eating at it and will want to wipe it down, I opted to apply a clear coat to the entire set. I put two coats on but more are recommended for outdoor use. Once that was dry it was ready for my deck. – Avoid painting in direct sunlight. Opt for shade. 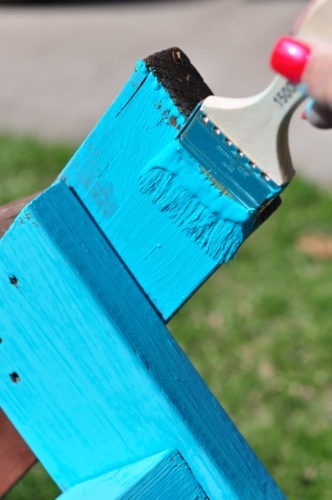 – Keep a spray bottle on hand to continually mist your piece. – Thin your paint as needed, the heat will thicken your paint. Here’s to a great and colorful summer! Thanks for the tips. 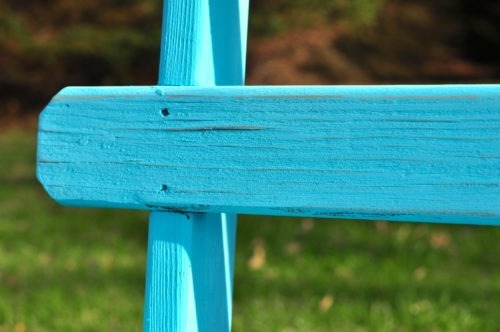 Repainting outdoor furniture looks fun and it makes it even more beautiful. Nice post. Wow, perfect timing! I am just heading out to paint a wicker table on the porch. I figured out the painting in the shade, but the spray bottle is a great additional idea. Happy summer to you!